Jerry McHugh, Jr., CEO/President – Mr. McHugh began his career in the San Juan Basin working for independents Dugan Production and Nassau Resources. He worked in land, government liaison, exploration, gas marketing, and production. In 1990 Mr. McHugh formed San Juan Resources, Inc. and has built the company to what it is today---a forward moving independent natural gas and oil producer. 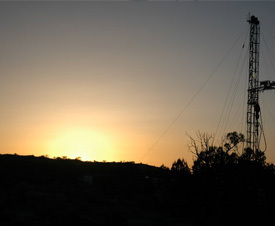 SJR operates 40 wells in the San Juan Basin. Mr. McHugh has been involved in nearly every aspect of oil and gas across his forty-plus years in the industry. He has worked with his technical/finance team to create ground floor exploration and drilling projects, acquiring profitable tough-to-get leases in the San Juan. Lori Walters, CFO/Controller – Ms. Walters has spent nearly 25 years in the oil and gas business with over half her tenure as Controller and CFO at San Juan Resources, Inc. Throughout her career, she has held individual contributor and managerial roles in accounting. She has worked many facets of oil and gas accounting including plant and gathering system allocations, revenue, joint interest billings, budgeting, tax, and financial reporting. She strives to uphold accounting best practices while providing a factor of overall corporate governance. Ms. Walters maintains an active CPA license in Colorado. Duncan Shepherd, Reservoir Engineer/Project Engineer – Mr. Shepherd founded and manages Petroleum Resource Management Corp., an independent O&G company developing Rockies assets for over 28 years. PRM has operated BLM federal units, managing production and drilling gas and oil wells. PRM recently drilled 2 wildcat discovery wells in an over-pressured Niobrara play at 10,000’ TVD. The most recent well is a 10,700’ lateral which was successfully completed in 47 stages with over 11 MM # of sand. Bob Brooks, Geological Engineer – Mr. Brooks has 35 years of reservoir engineering experience beginning at Amoco, Tom Brown Inc., EnCana, Williams/WPX and as a consulting reservoir engineer. His experience includes all phases of reservoir evaluation from exploration, initial development on to secondary and tertiary recovery. Mr. Brooks experience in unconventional reservoirs includes shale gas and tight oil developed with horizontal multifrac laterals. Mr. Brooks was involved in the initial evaluation and development of the Fruitland CBM and the exploration and pilot testing of both the Mancos Dry Gas and Regressive Gallup Volatile Oil plays in the San Juan. Mr. Brooks brings a multidisciplinary approach to reservoir studies in order to develop the best understanding of well rate, reserves, economic optimization, risk and uncertainty. Rich Bosher, Geologist – Mr. Bosher has 35 years’ experience in upstream oil and gas as a prospecting geologist for both conventional and unconventional targets as well as business development buying and selling oil and gas assets. Mr. Bosher began his career at Amoco, then to TransZap (Oildex) as founder/VP Sales, and eventually moving to Teton Energy. Under his E&P company Mr. Bosher has prospected extensively for Mancos Niobrara shale opportunities in the San Juan Basin/Rockies, acquiring producing assets with acreage in prolific unconventional plays in Rockies basins and East Texas/ Louisiana. In addition, Mr. Bosher has sold a half dozen conventional oil drilling deals in Kansas. Alan Hartse, Wellsite Engineer/Drilling and Completion Consultant – Mr. Hartse has spent nearly thirty years as a self-employed Wellsite consultant. He’s performed well planning, drilling, completion, and workover of wells primarily located in the Williston Basin of North Dakota, South Dakota, Wyoming and Montana. Mr. Hartse specializes in Horizontal and Directional well work. For the past three years Mr. Hartse has been primarily working for Shell Exploration and Production in the Cedar Creek Anticline drilling grass-roots horizontal wells in the Red River, Mission Canyon, and Stony Mountain formations as well as vertical wells in the Lodgepole formation at Dickinson, North Dakota. His work also encompasses re-entering existing vertical wells and converting them to horizontal wells in the Cedar Creek Anticline area around Baker, Montana and in Michigan. Mr. Hartse was recently well site engineer with Mr. Shepherd in horizontal exploration project in Moffat County, Colorado.